Astronomers have discovered the largest and farthest reservoir of water ever detected in the universe in a quasar called APM 08279+5255 - enough water to fill Earth's oceans more than 100 trillion times. The distant quasar is one of the most powerful known objects in the universe and has an energy output of 1,000 trillion suns, about 65,000 times that of our Milky Way galaxy. The power of APM 08279+5255 comes from matter spiraling into the quasar's central supermassive black hole, estimated at some 20 billion times the mass of our sun. The discovery was made with a spectrograph called Z-Spec operating in the millimeter wavelengths, found between the infrared and microwave wavelengths, at the Caltech Submillimeter Observatory, a 10-meter telescope near the summit of Mauna Kea, on the big island of Hawaii. Z-Spec's detectors are cooled to within 0.06 degrees Celsius of absolute zero in order to obtain the sensitivity required for these measurements. Because APM 08279+5255, essentially a voraciously feeding black hole, is so far away, its light has taken 12 billion light years to arrive at Earth. One light year equals about 6 trillion miles so the observations reveal a time when the universe was very young, perhaps only 1.6 billion years old. Astronomers believe the universe was formed by the Big Bang roughly 13.6 billion years ago. 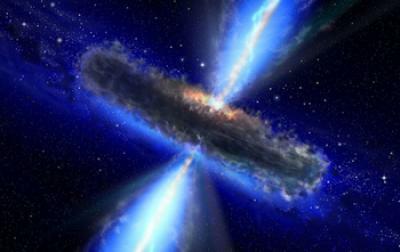 The water measured in the quasar is in the form of vapor and is the largest mass of water ever found, according to the researchers. The amount of water estimated to be in the quasar is at least 100,000 times the mass of the sun, equivalent to 34 billion times the mass of the Earth. In an astronomical context, water is a trace gas, but it indicates gas that is unusually warm and dense, said study leader Matt Bradford of Caltech and NASA's Jet Propulsion Laboratory in Pasadena. "In this case, the water measurement shows that the gas is under the influence of the growing black hole, bathed in both infrared and X-ray radiation." The water measurement, together with measurements of other molecules in the vapor source, suggests there is enough gas present for the black hole to grow to about six times its already massive size, said Bradford. Whether it will grow to this size is not clear, however, as some of the gas may end up forming stars instead, or be ejected from the quasar host galaxy in an outflow. In the Milky Way, the mass of gaseous water is at least 4,000 times smaller than that in the quasar, in part because most of the water in our own galaxy is frozen into ice. While the water vapor in the Milky Way is found only in a limited number of regions, a few light years in size or smaller, the water in the distant quasar appears to be distributed over hundreds of light years, said the researchers. "Breakthroughs are coming fast in millimeter and submillimeter technology, enabling us to study ancient galaxies caught in the act of forming stars and supermassive black holes," said CU-Boulder Associate Professor Jason Glenn, a study co-author and co-principal investigator on the Z-Spec instrument development. "The excellent sensitivity of Z-Spec and similar technology will allow astronomers to continue to make important and surprising findings related to distant celestial objects in the early universe, with implications for how our own Milky Way galaxy formed." The discovery highlights the utility of the millimeter and submillimeter band for astronomy, which has developed rapidly in the last two to three decades. To achieve the potential of this relatively new spectral range, astronomers, including the study authors, are now designing CCAT, a 25-meter telescope for the high Chilean Atacama desert. With CCAT astronomers will discover some of the earliest galaxies in the universe, and will be able to study their gas content via measurements of water as well as other important gas species, Glenn said.